During this month of October I have thought about this topic and kept putting it off, yes it is breast cancer month, but why talk about it? It is scary enough and I writing about it doesn’t sit very well! After all it is said that we attract what we think…and write? I have only seen those affected by cancer talking about it, sharing their experiences. Like every woman, I just hope that I never get to do talk about it. But so does every woman, but the statistics are rising by day. My only close encounter with cancer is a friend, a young lady who died of cancer about 7 years ago when she was very young, 22 yrs. Prisca started having pains in her stomach and she was (wrongly) diagnosed with appendicitis and had had appendices removed. The pain continued and in the long run it was realise she had colon cancer. In her last days she was a great encouragement (yes she was the encourager!) to friends and family. She was so optimistic and despite the fears that her family went through trying to explain the reason (and seek solutions) for her suffering as some family curse or other issues that needed some un-natural interventions, she kept strong, with her faith in God growing every day. I remember her saying that “the doctors will slice up and cut my body, but they will never touch my soul”. She went through one operation after another with all the things that can go wrong going wrong and having to have another emergency all over to correct some error! She died happy, and though her body was very fragile, her spirit was as strong as ever! October is the breast cancer awareness month and it has got me thinking, what do I know about this? I set out to read more on this and the information I have come across is intriguing. I wish to share the insights and stories that I have come across. Breast cancer is also found among men but rarer hence the experiences are of women. One of the most inspiring stories is of 31-year- old Josephine Muthoni, who had a mastectomy when she was just 21 yrs old. The worst part of it is that she didn’t have to go about this! [1}. Josephine, then a student at the university had the lump for over one year and when it seemed to be getting bigger so she sought for medical attention. The shocking news was given to her that the lump was cancerous. A mastectomy, (surgical removal of one or both breasts) was done and she lost one of her breasts. She went through a lot with society pressures and lack of empathy and while dealing with this entire drama she learnt to her shock that - the cancer that had been detected in the lump had not spread to her breast, meaning that the surgery she had undergone was not necessary at all. She didn’t have to lose her breast, but it was too late. She made up her mind not to concentrate on the loss anymore but rather have a life and continue with her education and be a doctor like she had wished. Naum Ochweri on the other hand was not young when she went through her mastectomy as she already had children in the 30s. She shares her story (Daily Nation 7th Oct 2009) of how she refused to let cancer ruin her life. She didn’t even inform her family the extent of the procedure that she was going through. Surprisingly she says that losing her breast was not a big deal and that she still feels beautiful! Talk of internal perception of beauty! These are just a few of the women who have had different kinds of experiences, mostly life changing as they battle breast cancer. The realization that one has this life threatening ailment always come as a shock. Cancer survivors further suffer the stigma associated with losing a breast. A breast is a very intimate part of a woman’s body and many feel that they are less of women when the loose a breast. This affects not only their physical body but also their self esteem and sexuality. "You don’t really know what your breasts mean to you until you risk losing them," says Ms Catherine Ngaracu, a breast cancer survivor. She believes a woman is defined by that part of the body. For another survivor, Ms Caroline Mumo After having a mastectomy she stopped visiting relatives’ upcountry because she was labeled a witch for having one breast! What inhumanity. . In the streets she was met with strange stares and her husband started staying out late into the night! Many women, young and old tell the stories of their traumatic experience with breast cancer. The greatest inspiration as I read these stories is the kind of stamina that made these women rise up and make something out of their situation and many have even started initiatives that aim to help fellow women. 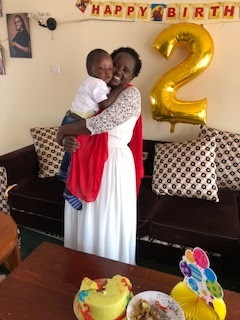 Elizabeth Ragui a breast cancer survivor knew that she wanted to something about encouraging someone with the disease when she was still in hospital undergoing treatment for breast cancer. She particularly wanted to let more people know about how early detection could lead to a cure. Her organisation, Reach to Recovery Kenya, is a breast cancer support group that gives psychological support to breast cancer patients by visiting them in hospitals during and after treatment. They not only offer emotional support, but also practical information on getting through. As we commemorate the breast cancer awareness month, the challenge is to remember that prevention is better than cure. There are several suggestions on how to go about this, but first and foremost is the monthly self examination. Women especially have to develop the habit of doing the self examination and seeking medical assistance whenever there is something ‘suspicious’. This demands an intimate relationship with our bodies, so that any change is noted. I came across some intriguing information that breast feeding is one curative measure! According to an article published in the Daily Nation  scientific findings show that young women who come from families with a history of breast cancer, and who decided to breast feed after birth, have a 59 % lower risk of developing the malignant disease. This is a wake up call for the women who opt not to breastfeed, it’s not only good for the baby, but for you too! Nature has not been known to let us down. Extracts from a fruit tree found in many parts of the world have shown dramatic success in killing cancerous cells in the lung, breast, prostate, colon, liver, ovarian, cervical, breast, bladder and skin. The annona tree family has over 110 species mostly growing in the wild with the main ones being Annona muricata found in the Amazon rainforest and the Annona cherimola, which is grown locally and known as ‘matomoko’ in Kenya . A study at the Catholic University of South Korea found out that an extract from the plant was 10,000 times more effective in killing colon cancer cells than the drug currently in use! There is definitely hope. As we commemorate the breast cancer month, it is the duty of every woman to get the time for their bodies. The statistics of cancerous diseases are on the increase, and the lifestyle doesn’t help, coupled with the ‘busy life’ that we have got accustomed to. This is no excuse, we can not afford to be too busy to live! We also need to support those who are undergoing the traumatic experience. Some simple gestures like not staring at a woman wondering why the flat chest on one side would do wonders to the women who keep feeling there is something wrong with them. Take care of yourself this month!